Morning depart from Las Vegas and proceed to West Grand Canyon. Also experience the famous Skywalk suspended 4,000 ft. above the Colorado River (This $30 million glass bridge can withstand the weight of 71 fully-loaded Boeing 747 passenger planes). 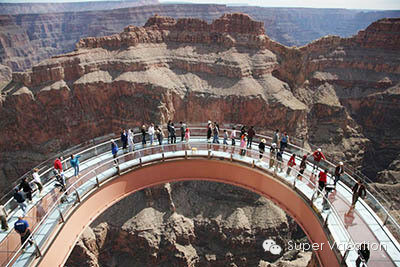 You can also view the canyon in a helicopter or take a boat ride in the Colorado River. Return to Las Vegas in the evening. ※ Driver & Tour Guide’s Service fee at $10 Per Person Per Day.